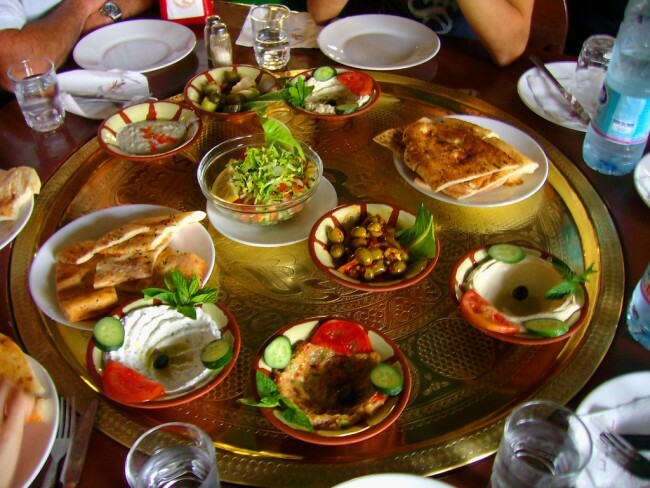 Mezze, or a meal composed of an assortment of small and diverse warm and cold starters, finds itself high on the list of things to sample in Turkey. Though it is also popular in Balkan and Middle Eastern countries, Turkey is home to a unique class of traditional eateries specializing in mezze called meyhane. Alcoholic beverages, usually raki, accompany the food. We take a look at some of Istanbul’s more popular meyhanes for an authentic mezze experience. Meze by Lemon Tree is a small meyhanes of no more than seven tables situated opposite the Pera Palace Hotel. Run by Chef and owner Gençay Üçok, whose dream it was to open a place like this since his student days, this is the place to experience a refreshing twist on a familiar concept. Gone are the troubles of navigating through long lists of standard dishes. Instead, all of the vegetable and seafood starters on offer are prepared according to seasonal availability. True to the basic ingredients of Turkish cuisine, their combinations are often innovative and accompanied by an impressive wine list. Tucked away on a quiet street in the city’s hip Cihangir neighborhood, this homey venue – adorned with gold-leaf wallpaper, redbrick walls, candles and chandeliers – serves Armenian-style variants of traditional Turkish mezze dishes. Enjoying a longstanding reputation for the authentic nature of its fare, Jash, which means ‘food’ in Armenian, offers diners a wide range of fresh salads and hot and cold starters, including the highly recommended yayamin: a potato patty prepared with grated potato, and topik: a chickpea and potato mash with onions, tahini and currants. Salkim Meyhanesi is arguably better known by its nickname ‘the car-wash meyhane’, due its location above a now defunct car wash. Salkim Meyhanesi is a small, no-frills venue, serving old-school meyhane and hefty glasses of traditional raki. It is run by a group of brothers hailing from Turkey’s eastern city, Van, whose Anatolian influence finds its way into a stream of local mezze dishes including pan-fried liver and grilled fish. Address: Süslü Saksi Sokak 27a, Beyoglu, Istanbul, Turkey. Known for its convivial atmosphere and friendly service, Sofyali 9 is a popular classic meyhane particularly busy at weekends. Waiters move from table to table carrying trays of cold starters to choose from, while hot ones are ordered individually from the menu. Due to a distinct Aegean influence, highlights tend to be from the seafood section, including the grilled octopus, curried fish, and the fried calamari. Booking in advance is essential. Duble Meze Bar is an upmarket venue with a classy atmosphere and great views over the Golden Horn. Set atop Palazzo Donizetti Hotel in Asmalimescit, they serve classic meyhane dishes with a modern twist, including hummus with sauteed mushrooms and roasted peanuts, and a signature a savory shrimp ceviche. Aside from Sunday and Monday nights, the place hosts a resident DJ usually playing lounge Turkish music. When it gets late, the music gets louder signalling it’s time for a proper party, dancing and all, to kick in.